Hummingbirds - First let me state that the photos here are NOT Ruby-throated Hummingbirds. I took these photos in Costa Rica at La Selva Biological Station in 2008. I couldn't resist showing it since it's rare to get to see these nests because they're so small. I've never been able to find "our" hummingbird nest here or in Alabama. We have the Ruby-throated Hummingbird here every year. There are several males and females. The males continually chase each other away especially if they have established a territory with a feeder. The female will prepare her nest before mating and the preferred nesting area is near the edge of a main tree branch that slopes downward. 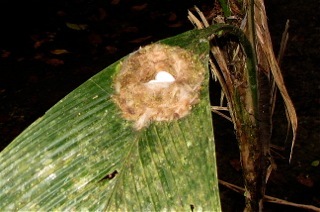 The nest is below a leaf canopy and on top of an open area. This nest was located only about 10 feet in from an open grassed area with many flowers for nectar and insect collection. They use spider webs, bud scales, plant material and pine resin. I don't think there were pine trees in this jungle area of Costa Rica, but they do have them in the higher elevations. The outside of the nest is decorated with lichens and strengthened with spider webbing and other sticky material, giving it an elastic quality which allows it to stretch to double its size as the chicks grow and need more room. It's lined with plant down (often dandelion or thistle down here in USA), animal hair and/or feather down. After completing her nest, the female is ready to accept suitors. When a female hummingbird comes by the male, he will show off to tell her he's the best mate. If she approves of his display, she will mate with him. Ruby-throated Hummingbirds are solitary and only come together to mate. They typically breed between March through August, with peak breeding season being mid-May. In other hummingbird species, the male does aerial displays, but with the Ruby-throated it’s the female that leads this ritual. Hummingbirds do not mate for life or stay together as a pair. After mating, the male leaves and mates with other females. 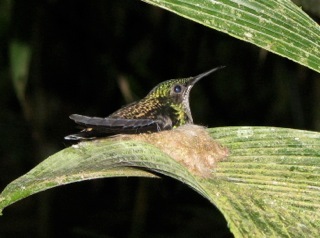 Female hummingbirds will defend their territories against other females during a short period prior to laying eggs. When it's time for the female to lay her eggs she will sit on the nest, quiver and wriggle her body every few seconds and will usually lay only 2 eggs. The eggs are small as a pea or jellybean and white. She may lay her eggs on two different days, but the eggs hatch out at the same time she doesn't start the incubation period (about 10-14 days) until the second egg is laid. She incubates and feeds the hatchlings on her own. Newly hatched hummingbirds are blind and naked. At about 3 weeks old, they are ready to leave their nest. At age one year old, they can start breeding themselves. Ruby-throats can produce up to 3 broods every year. Ruby-throats are intensely inquisitive and easily attracted to feeders, where males in particular typically display aggressive territoriality toward rival hummers, other birds, and even insects. A female will tolerate her own young at her favorite feeder for a short time after fledging, but will soon treat them as rivals. They quickly become accustomed to human presence, and will swoop down to investigate anything being worn that is red, considering it a possible food source. A bird that claims a feeder as its territory spends much of the day perched nearby, guarding it against intruders. The Ruby-throats primarily feed on nectar taken from over 30 plant species - favoring those with red, long, tubular flowers. They typically choose flowers with the highest sugar content. They use their long, straw-like tongues to retrieve the nectar while hovering, licking at the nectar up to 13 times per second. Learn more about White-necked Jacobin Hummingbirds. We've got some really loud Blue Jay babies flying around. It seems they are trying to out-scream each other. Just like children, eh? They are so pretty as they fill in those bright blue colors and try to figure life things out in this brave new world they've entered into. 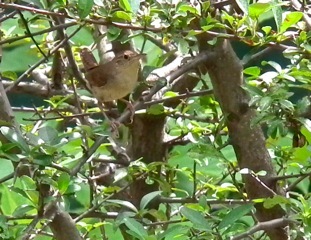 The House Wrens are now feeding babies and ready to fledge. They really fuss at me when I go out to get a picture and will not fly to the feeder with the food, so I've not had a chance for a good shot. But I do delight in being able to get some photos of them now that they're staying close to the birdhouse. The photo you see here is one where I was waiting for them to feed and they were sitting in the bush waiting for me to leave. See that stubborn look on its face? I could easily shoot from inside at the dining room window, but with the sunlight behind the house, all I get is a black outline of the bird against a bright sky. I've decided to leave them alone to do what they need to do. It's a delight for me to see them without having a photo. TIDBIT: Pets - Corn Starch is wonderful for helping to untangle mats and tangles on dogs and cats. It is harmless and makes grooming so much easier as it lubricates. Combing, especially with a comb with rotating teeth, is so much easier using corn starch. Here's an article with 13 Surprising Uses for Cornstarch. Spiritual - It's incredible the sound of the birds in the morning when I wake up. It brings an instant smile to my face and I say, "Good morning, Lord! Another day in Paradise with You." We have need of no other entertainment than our wildlife shows that run all day long. The birds are an instant reminder in the morning that we have much to praise the Lord for and that there is always a bit of Paradise in our days if we look for it. We have the mental struggle of wanting to live further south, but leaving our wildlife habitat here is something I can't imagine. How we'll ever make that transition I don't know, but I am always in prayer about it. I would certainly need to know somebody was going to enjoy it and provide the work it takes to keep up with it. And if that happens then I know God has an even better place after this. Kinda like the Promised Land! We will trust in the Lord for a way back south ... and when I hear the birds singing their praises in the morning for the provision that only God can give them (yes, through people that love His Creation). They don't wake up wondering where their food will come from ... they've been seeing their entire life that there is always provision and are thankful for it. Butterflies - It's been butterfly month here for sure. 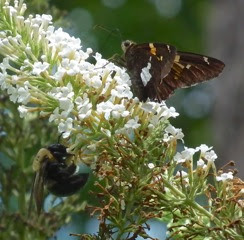 The Butterfly Bushes (Buddleia davidii) are in full bloom and the butterflies are loving it. I saw our first Monarch on August 2nd. I went out briefly to photograph it and also took photos of a Eastern Tiger Swallowtail and a Silver-spotted Skipper which you see to the right. We get a lot of the Swallowtails. It's Virginia's state butterfly, seemingly well chosen for sure. We may not see all the species we usually do in any given year, but we've always had the big yellow Eastern Tiger Swallowtail. They've been all over the Joe Pye Weed that is planted at the rain spout between the screened porch and deck. They love water. 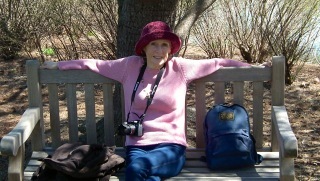 I'd like to share part of the information I received from Chip Taylor at Monarch Watch. It's encouraging news this year for the Monarchs. "The number of reports of sightings has increased over the last few weeks and there have been reports of eggs – lots of eggs – mostly in the regions previously identified as likely to have a good migration (Dakotas to Michigan). The number of eggs found and the distribution of these finds now leads me to suspect that the migration through the upper Midwest will be better than any migration seen since 2011. This is good news since the tagging, isotope and observational data suggest that more than 90% of the monarchs reaching Mexico originate in this region. Most of the butterflies join the migration from late August through early October as it moves progressively southward starting about the 10th of August at 50N (Winnipeg). The 45-day forecast is also encouraging since it suggests that temperatures will be favorable for the development of the migratory generation. It will be a battle but we need to get the overwintering numbers [in Mexico] up to at least 4 hectares [almost 10 acres] in the coming years. It will require a massive effort to restore milkweeds in the milkweed/monarch corridor that extends from Texas through Minnesota. PLANT MILKWEED!" Get more detailed information. Gardening - Dubai Miracle Garden sets a momentous world recognition of the garden declared as the “Largest Vertical Garden” in the World by the Guinness. This breathtaking garden called “piece of Eden” will continue to stun visitors with millions of blooming flowers having different artistic design each season. This is a rainbow-colored oasis with 45 million flowers is in the middle of a desert which are watered by a system that recycles waste water while avoiding evaporation. There is a multitude of shaped archways, flowerbeds and structures to be seen at the 18-acre site. View some photos here in their gallery. 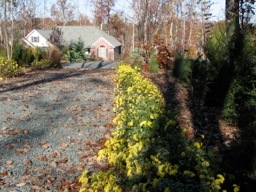 Simple Weed Removal - We've used salt for many years on our gravel driveway to keep the weeds out. We would buy 25# bag but every time we did it we'd have to chop down the salt since the moisture in the garage over time would turn it into a rock. This year we had a lot to do on the driveway since Randal hasn't been able to keep up with everything in a timely fashion since he's without the gardener that dedicated parts of every day to "something outside to do." Vinegar works just as well as salt and since we have found a discount place to buy such things, we picked up a few gallons of white vinegar at $1.99 a gallon. Now Randal just pours a gallon of vinegar into his garden sprayer that we've never used chemicals in and squirts all the leaves on the driveway and down into the roots. It takes about 2-3 days depending on weather conditions. Then they're brown and dead. Of course if you've got weeds that have already gone to seed, you'll see some next year to do again. Get them before they bloom and you won't have so many. Not all seeds bloom the next year, sometimes they remain there for years ... but as you can see, it would mean less and less seeds and little to do after you begin getting them under control. Get a couple more ideas. Critters - About a week ago, we began seeing some baby Five-lined Skinks on the deck. They remind me of the squirrels since they chase each other all over the place like the young squirrels do. They seem to delight just in the joy of life. We all need to take time to play! But the excitement of the summer has been to get to pet a Black Rat Snake. 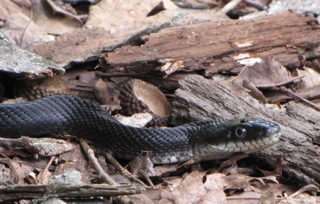 I was sitting on the walkway in front of our house to clean up a couple of plants there and didn't even realize that there was a Black Rat Snake only 3.5 feet away. It was perfectly still. I had seen a branch out of the corner of my eye, but it turned out not to be a branch. Fortunately I had my camera and got to take pictures and videos. I snapped a shot of my hand petting him. I love the feel of a snake and I wanted to pick him up, but I'm sure there's still that old fear implanted somewhere in my early life that made me not do it. But I'm one step closer! I'm sure that it's stressful to the snake. Black Rat Snakes are very docile snakes and are not aggressive unless they are threatened and you can get really close to them, so what they consider aggressive is a direct attack. One year I was trimming some huge bushes with the loppers inside the bush and as I leaned under the bush to see where to cut there was a black "water hose" amongst the branches and just as I was saying, "Who put that there?" I realized it was a snake. He had not moved even though I'd been pruning all around him. Don't mind having somebody pass me a snake that is already being held so I don't have to figure out how to pick it up. I did that in Singapore when a guy had an Albino Ball Python around his neck. I asked if I could hold it and he passed it on to me and it was so heavy I automatically put it around my neck so I wouldn't drop it. View the photo of me with the python snake. I also don't mind baby snakes like this one in my hand which is a Baby Northern Water Snake. 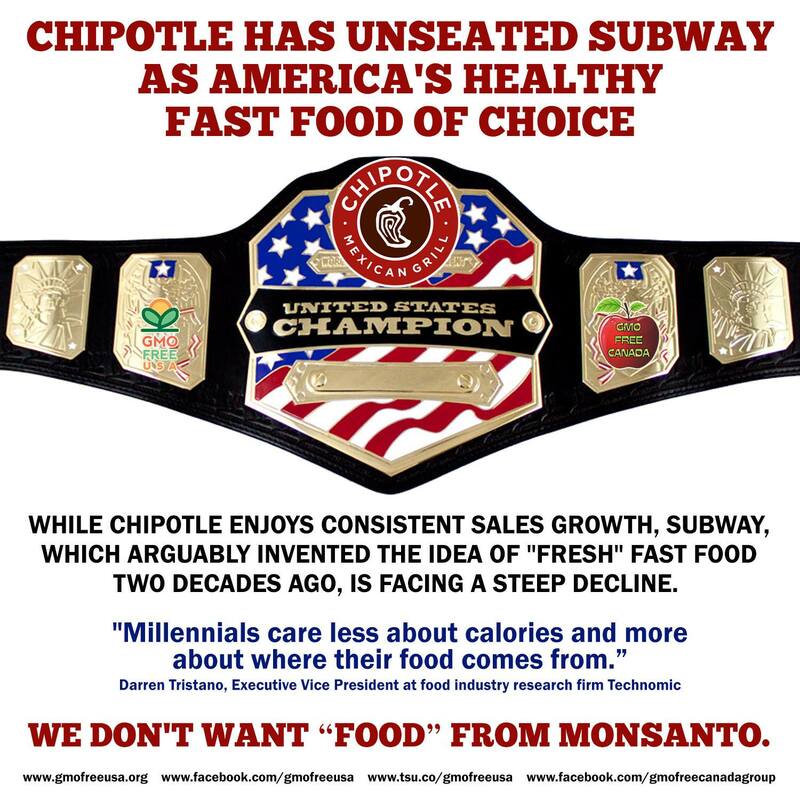 TIDBIT: Fast Foods - Chipotle has unseated Subway as America's healthy fast food of choice says Business Insider UK: Chipotle has removed GMOs from its ingredients this year, but Subway is dragging its feet. While Chipotle enjoys consistent sales growth, Subway, which arguably invented the idea of "fresh" fast food two decades ago, is facing a steep decline. Subway's U.S. sales last year fell by 3%. "What Americans see as healthy has evolved. 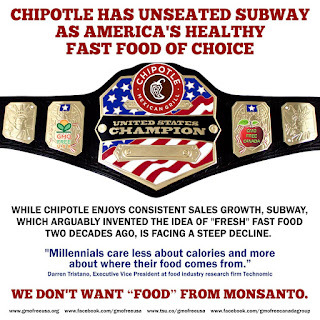 Subway hasn't," Drew Harwell at The Washington Post writes. Darren Tristano, Executive Vice President at food industry research firm Technomic, adds, “Millennials care less about calories and more about where their food comes from.” Actually, we ALL care where our food comes from. America doesn't want “food” from Monsanto. Period. More details on the new thinking that where the food comes from is more important than calories. Closing - For those with children summer is almost over. The school year seems to dictate that and many schools are starting earlier each year. I hope you've made some special memories with your family this summer. There's still time .... and of course Fall is on the way which will provide plenty of lovely days to get out in Creation and experience the peace and joy of it all. We really need to take more time for ourselves - to value ourself as God sees us. We are made in His image. I mentioned an audio series above called Valuable You. You can download all 4 segments. Find time to listen and ponder the message. Don't let life slip by you!